Today marks 125 years since the driving of the last spike at Craigellachie, British Columbia that finished Canada's first transcontinental railway. I understand CP is donating surplus "heritage" equipment as part of this celebration. Read on CP's site. The list (PDF) includes such items as tool cars, baggage cars, sleepers, mail cars and an autorack. The autorack is in the Moose Jaw yard and you can see it on the left side of this photo I took in May 2010. Hopefully some museums will take CP up on its offer and preserve some of this equipment. The owners of the Gaspé line plan to terminate the marketing and network operation agreement with CN by February 1, 2011. This article says they feel they can operate the line cheaper and market it better using local knowledge. The fact that CN uses unionized labour was also mentioned. You may recall that CN was pulled off the maintenance of the line in April 2010. I do question who is going to supply cars for them... I assume CN will still do that since the Gaspé line is captive to CN. On Tuesday (August 26) I set out to buy some new Birkenstock sandals, as my old ones are in a very sad state. Since I'm in Phoenix (again), my wife pointed me to Shamrock Shoes. I checked and they were only open until 5 PM, so I hustled up the I17 and made it there with 5 minutes to spare. Afterward, I decided to go railfanning. I headed west until I hit Grand Avenue, then followed it northwest. Grand parallels the BNSF line out of Phoenix. Unfortunately, Grand is under serious construction and progress was very slow. I didn't see any trains on my long and slow drive, until I reached Surprise / El Mirage. I was up in this area in July. On the Ennis subdivision that joins the main Phoenix subdivision, a short local train was waiting. BNSF 2836 and BNSF 2945 were at the head of a train with a boxcar and about a dozen tank cars. A crew van was there and the outgoing and incoming crews were having a chat. I approached and asked if they would mind if I took a few shots. They were quite friendly and said for me to go ahead. I took several, and a few more after the van left. The one above is probably the best. This train wasn't going anywhere, so I went up Grand Avenue a bit more. I saw a headlight approaching, so I went back to a crossing and set up to try night video with my Canon T1i . I hadn't done any night video and I was curious to see how it turned out. Well, let's just call that "disappointing". It had four big engines on the head end. While I was looking at the BNSF local, I shot one of the industrial engines at the auto rack facility across the highway. Given the poor light, and my lack of a tripod, it was difficult to get a good shot but I lucked out with this one. And sometimes that made me sad. Of a man named Leroy Brown. All videos from May 2007... it's been a while! Jeff Keddy took a few shots of the Prairie Dog Central's newest engine, BNSF 1685. You might remember that it was donated to the PDC back in July 2010. 1685 was a fixture in the Winnipeg railway scene, having started as Midland Railway #2 before becoming Burlington Northern Manitoba Limited #2. The PDC is running Halloween trains this time of year. Visit their web site to book a trip! I was in Transcona Saturday around supper time, and I spotted a longish container train in CN's Transcona yard. I stopped at the crossing on Ravenhurst Drive and took a few shots. After a few minutes, the engineer turned the lights on and started pulling. The three engines made a nice racket as they strained to bring the train up to speed. The end has come for ex-CP SW1200 #8131 in Winnipeg. If you recall, it arrived in Winnipeg in mid October 2009. The photo above shows it in Symington Yard. It ended up along Chevrier Boulevard near the old Manitoba Sugar building. It has been moved a couple of times but always in the same area near Manitoba Hydro. I shot it in early September and it looked intact and essentially undisturbed after almost a year in Winnipeg. I drove on Chevrier Boulevard on Wednesday morning and I saw that the engine had been moved. I took a bit closer look and I could see that people were working on it, and I saw the front and side panels were off the engine. There were sparks coming from the nose. I came back a while later with my camera and took this one shot with my long lens. It has been moved back and it is not as accessible as it was last month. As you can see, pieces have been removed from the engine. The horn, plow, MU hoses, and some handrails are gone, and obviously the panels are off. It looks very much like the other engines that were scrapped at this location in the summer of 2009. Too bad. I had a bank errand to run late Monday morning. When I finished, I was on Pembina Highway just south of Fort Rouge. I stepped out of the bank and heard the unmistakable sound of a train engine in run 8 struggling to get a train moving. At that time of day it had to be CN 532 heading down the Letellier subdivision. I raced down to McGillivray and parked by the Rexall pharmacy. Very soon I saw CN SD40-2 #5264 struggling to pull a fair sized train by itself. I imagine the nice thing about the Letellier subdivision is that it is straight and flat, so once you get a train moving you shouldn't need much power. Starting must be a problem! I wanted to wait for the Canadian, so I went to Fort Rouge and parked on the street. I saw BNSF 3028 was doing a quick turn in the yard. They kicked their cars into the yard, then doubled up the return train and headed out. Once BNSF left, there was nothing in sight, so I decided to go back to my car to get my tripod. On my way back, a CN eastbound rolled by with CN 5765 and IC 1029 on the head end. I think it was probably CN 198, given the time, and the junk cars at the head end followed by containers. I was a little concerned that CN would block my view of the Canadian, but luckily the tail of the CN eastbound just cleared in time for VIA to be visible on the north track. As usual, there were no repainted units on the Canadian. I know they have passed through Winnipeg, but I have yet to see them. It'll happen eventually. Not much was going on at Symington, so we carried on down Marion and Archibald streets. As I passed Plinguet Street (home of the GWWD railway) I saw the crossing lights come on. A quick U-turn brought me back to see a CP train getting ready to head out of Winnipeg. AC4400 CP 9731, dual flag SD40 CP 6061, and GP38 SOO 4426 were heading up a general freight train. As you can see, I was on the wrong side of the sun, but there was no time to relocate. I love the white SOO units. The train show was good. My son and I enjoyed ourselves and I took photos and video. We retraced our steps, and as I drove by the GWWD I saw an eastbound CN freight on the High Line coming out of downtown. I zipped ahead to the Panet Road crossing and shot them there. SD75s are nice, but I really liked the Dash-8 CN 2437 trailing. For some reason I find myself liking the "older" power. It was about time to head home. We passed Symington Yard again, and as I got onto the Perimeter Highway I spotted a train coming from the Sprague subdivision. I quickly exited the highway and came around to shoot it by Tinkertown. That was really the end of train chasing for the day! I was running an errand Thursday (Oct 14) and found myself near Fort Rouge in Winnipeg just before 11 AM. I decided to see if there was anything going on in the yard. Sure enough, BNSF 3028 was there with a short train, waiting for their turn to return to the BNSF yard. As I approached to take the above photo, I saw a CN westbound train passing them. I missed shooting the head end, but I saw that IC 2708 was bringing up the rear. It was nice light for roster shots! I last saw IC 2708 in February of this year. I kinda miss those NB Southern units. Short lines are pretty interesting. You get to know the individual engines and often the crews too. I haven't spent enough time here to really get to know CEMR, and GWWD is still pretty much a mystery to me. I'll have to make more of an effort. If you're into streetcars, this site provides a comprehensive list of all Canadian urban and interurban electric railways. This list was compiled by David Wyatt, who has several other streetcar-related sites on the same server: Transit History of Winnipeg and Transit History of Brandon. He is a member of the Manitoba Transit Heritage Association. This slide (by David T Stowe, taken in London, Ontario) shows an interesting combination. CP 5671 leads two MLW warhorses, CP 4730 and CP 4234. The Canadian Pacific Railway Holiday Train will be touring Canada and the U.S.A. again this year. The schedules are online, and looking in my area the train will be in Manitoba on December 4 and 5. It will be in the dark in my area on the 4th, which I guess is good and bad. There should be some good time exposure photographs. With luck I might actually be in the province this year to see it! I was out yesterday on the holiday Monday doing a few errands, and of course I swung by CN's Symington Yard to see what was happening. I saw a couple of locomotives heading for the diesel shop, but what caught my eye was a container train heading out on the Sprague subdivision. I gave chase! The Sprague subdivision parallels the Trans-Canada Highway (#1) for several km before peeling off around Dufresne. I easily beat the train to the Floodway, but since my kids were in the car with me, I didn't want to park and go running off into the bush. We kept going down the highway, looking for a crossing. There is one right at Deacon's Corner just south of the Floodway, but I was looking for a more open shot, so I drove on. The squeaking you here is the sound of the rails moving up and down as the trucks roll over them. At about 2:09 into the video I shifted the view to try to show the rails moving. CN 5610 and 5636 were the matched power for this train. On September 17 I visited the Fredericton train station to see how construction was going. As I mentioned earlier, the old baggage shed was removed. In September work was well underway on the foundation for the new building that will be attached to the station. This building will house the main portion of the NB Liquor store. Here's the rear of the train station where the shed used to be attached. Another view from the rear. I tried to get the whole foundation in the shot. Note the old Hartt Shoe Factory in the background, on the other side of York Street. Bird Construction is working on this phase of the construction. Note the pile of bricks in the foreground. They have taken great pains to preserve as many original materials as possible. These two fellows are two former presidents of the Fredericton Friends of the Railway, an advocacy group that fought to have the station restored. My good friend Tim Scammell is on the left, and I'm on the right. Nice to see the work progressing! On October 5 I shot some engines at the Ogden Shops and at Alyth yard in Calgary, Alberta. I didn't have much time before the sun set, so it was a quick visit. These are the units I saw at Ogden. The most notable was CP 5745, with "Expressway" painted on the side. Here's a video with 5745 leading, from 2009. Over at Alyth, I didn't see anything like the Royal Canadian Pacific train I saw last time! These are the units I saw. I saw a few old GP9 units there, CP 1557 and CP 1601. Nice to see the old warhorses still at work. I saw CP 1601 in Calgary back in June. I noticed a little box just below the overpass. This is where all the SBUs (Sense and Brake Uunit, the thing that goes on the end of a train) are stored, I guess. It makes sense that there is a place at the exit to a yard for an SBU to be stored, so they can be put on outgoing trains. I happened to catch CN 532 by the old Manitoba Sugar complex today at 12:30 PM. 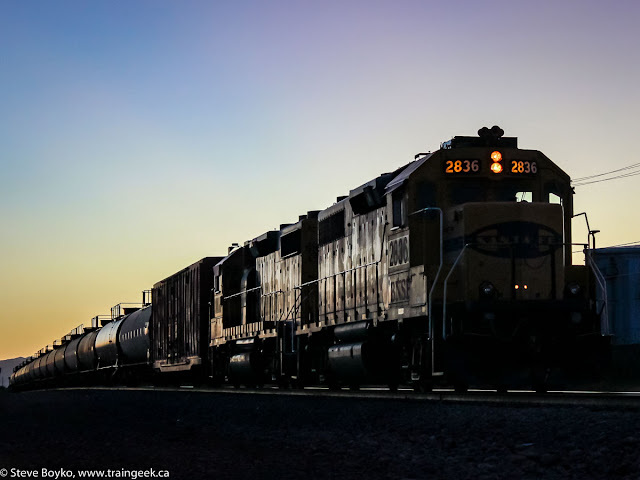 CN 8843 provided the sole power for a short train of 28 tank cars and grain cars. The sugar plant was built in 1940 by the Manitoba Sugar Company to process sugar beets. It was acquired by BC Sugar in 1955, but was shut down in January 1997. That was the end of sugar production in Manitoba. The only beet sugar processing in Canada is done in Taber, Alberta. I've been in Carseland, AB for the past couple of days, and after work I managed to spot a few trains. On October 5 I saw the local switcher units, CP 3092 and 3062, working at the tail of the wye. The conductor is on the ground lining the switch so they can go into a local industry. Note the caboose in the background (CP 434703). I headed down the road to shoot the two local elevators, the Cargill and Pioneer monstrosities. I drove to the actual town of Carseland.. mighty small! On my way back I was surprised by a CP eastbound freight. I shot it from a distance and I like the way it turned out. CP 9663 and 9583 led a shortish mixed freight. That was it for that day. I drove up to the CP Ogden and CP Alyth yards to document what was there... that's another post. Around suppertime on October 6, I saw the same two GP38s heading back toward Calgary. I barely managed to beat them to Indus and grabbed this video. There you have it, a little action in and around Carseland, Alberta. Today's slide depicts CN 1786 in Halifax, Nova Scotia, and was shot by Walter M. Matuch on May 30, 1976. CN 1786 was an RSC-14 built by the Montreal Locomotive Works. I believe it was the last RSC-14 on CN's roster, retired in May 1996. Notice the little red step stool on the ground near the cab. I wonder what it was there for? You may have noticed that I occasionally post scans of slides here. I buy some on eBay and I bought a collection several years ago. The problem with slides is scanning them! I have taken them to Wal-Mart for scans, and the results are OK but it is fairly expensive and the results are... disappointing. Right now you can have slides scanned to CD for 50 cents/slide (minimum 20) or have prints made at 97 cents/slide. I tried a few slide adapters for my scanner but they don't work well. I had resigned myself to the occasional Wal-Mart trip until I heard of ScanCafe. ScanCafe offers a by-mail service where you ship them your slides, they scan them (by hand), provide the scans online for review, then ship the original slides back with a CD or DVD containing the full-size images at 3000 dpi. "Interesting," thought I, and signed up. Within a few days they sent me a coupon code, good for scanning about 150 slides for free... provided I pay the cost of shipping (via UPS). I decided to give it a shot. I went through my collection and picked out about 150 slides (CN, CP and VIA with a smattering of American slides), boxed them up and sent them off via UPS. Since they are sent by UPS, you can track them to the destination in Burlingame, California. From there they are sent to their imaging center in Bangalore to be hand-scanned. They have a handy status screen on their web site so you can track the progress of your order. I sent the slides on September 12 and they arrived on September 20 via UPS Ground. They are currently in the queue to be scanned and they are forecasting that I can review them online on November 12. Once I review them and pick the ones I like (you can discard up to 20%), they will burn them to DVD and ship the DVD and the original slides back to me. You are charged for the slides you choose. It's not a speedy process but I think it is good for bulk scanning like I am doing. The price is good at 29 cents/slide (plus shipping). I look forward to the results, and of course you will see the results here on my web site. Incidentally, they scan negatives and printed photos as well. Check them out and see if you like them. Here are some photos of the Metis car in the NB Southern yard in Saint John... offered without comment or attribution. In August I visited the Herbert CPR Train Station Museum in Herbert, Saskatchewan. I was searching for grain elevators and decided to visit the museum while I was in the area. I'm glad I did. It looks pretty nice on the outside. On the grounds are three pieces of rolling stock: a snowplow, a caboose and a boxcar. CP 400798 is a double-track snowplow, built in August 1928. CP 56065 is a boxcar, built in December 1957. I like the old multimark. CP 434632 is a typical Canadian Pacific Railway steel caboose, built in July 1979. One of the things that drew my eye on the outside was this sign. What the heck is Faspa? The station is glad you asked. "Faspa is a coffee-break, tea-time. A coffee and cake time between lunch and supper. Traditionally, Mennonite homes served Faspa on a regular basis. ... Homemade bread, accompanied by butter, jams, and sometimes meat and cheese formed the centerpiece of Faspa. Frequently cakes and cookies followed the bread course... Nowadays Faspa is typically reserved for company on Sunday afternoons. Faspa is not necessarily served because people are hungry or thirsty, but rather as a shown of hospitality." - from a sign in the station. The station has a lovely dining room with two tables and some benches. I would think Faspa would be a pleasant experience here. The ticketing area is used as an office and greeting and gift shop area. I mentioned the dining room. The baggage area holds the actual museum. There are a lot of interesting items there. They have quite a few old books on display. I was amused to see that some of them are in my collection, too. Lots of union cards and railway passes here. They have a nice model train display. There is a great Virtual Museum feature on Faspa Country: a Herbert story that I encourage you to read. If you haven't visited Canada's Virtual Museum, you've been missing out.